There are no celebrations as big as the ones with religious background. 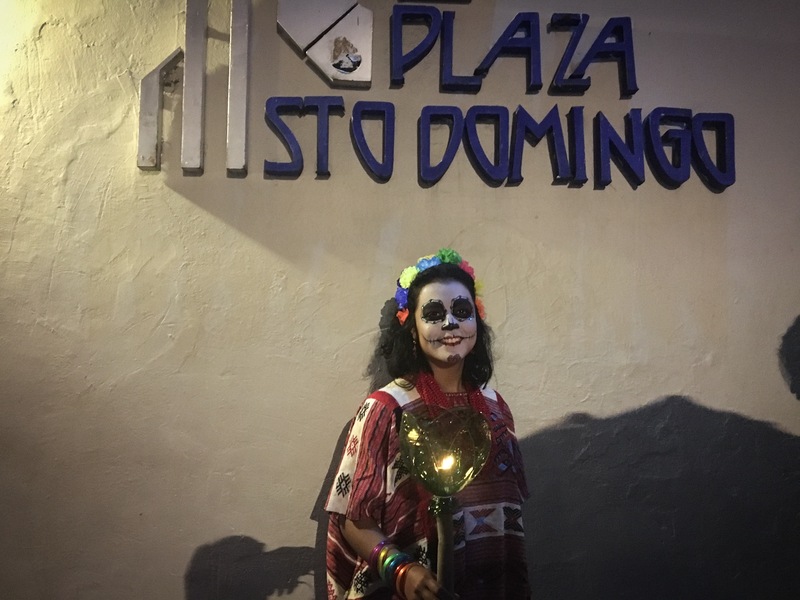 I am in mexico and The Day Of The Dead is a huge thing. It is an eight days ongoing party. In Oaxaca, where I am now, there are different parades not only daily but several times a day. I asked the guy at the reception where to see one and he said; just walk the streets and you will see one. They are everywhere. Every neighborhood has their own with a band and yesterday the local one passed the hostel where I’m staying. It is a festive happening. People paint their faces and wear costumes and they walk the streets and smile and music is played and… they just walk the streets. In the centre, by the main square, people gather every evening. They either just walk around or sit wherever possible to sit and just enjoy being a part of the crowd. And they eat. The street food is mainly about snacks. Corn in all possible varieties. The most popular stall is run by a young man, he seems to be in his twenties, is putting on a show while preparing the corn and there is a five to tem meters line of people waiting to be served and entertained. The corn cob is put on a stick, then covered in butter, then cheese and on top of that four different hot sauses. There are these corn vendors one can find every five meters serving the same thing but he is the only one where people are waiting in live. It’s all about the show. Food and religion. A winning combo. And this happens everywhere I have been where there has been any sort of religious celebrations. Altars where food is placed as offerings, food placed on graves as a symbol for the dead not having to be hungry and above all food the living eat to celebrate. In Bali people stick rice to their foreheads showing they have been praying. Food. Food used to be a precious possession back in the days when we didn’t have convenient stores. In the days when we had to grow our own food. So of course people were offering food to the gods when food was scarce. Nowadays we are stuffing ourselves whether we need it or not. And most of the religious celebrations are not as religious as they used to be. Everything changes and evolves. Tonight I’m going to a cemetery to witness the celebration of The Day Of The Dead. I will think of the loved ones that are no longer physically with me. The ones that are being transported on another escalator in this quantum world.